Síneoidh an t-údar gach leabhar a cheannóidh tú le teachtaireacht speisialta don duine mór i do shaol. Tá an tSraith leabhair do pháistí Kapheus suite i dtírdhreach na hÉireann ar Shlí an Atlantaigh Fhiáin agus is scéal fantaisíochta eachtraíochta é do pháistí os cionn 7 mbliaina d’aois. 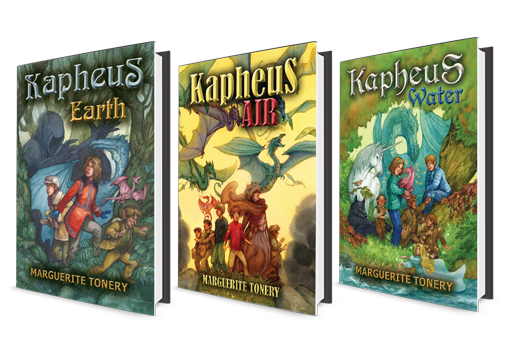 The new fourth book in the series, KAPHEUS FIRE, will be published and in book stores this October 2018. 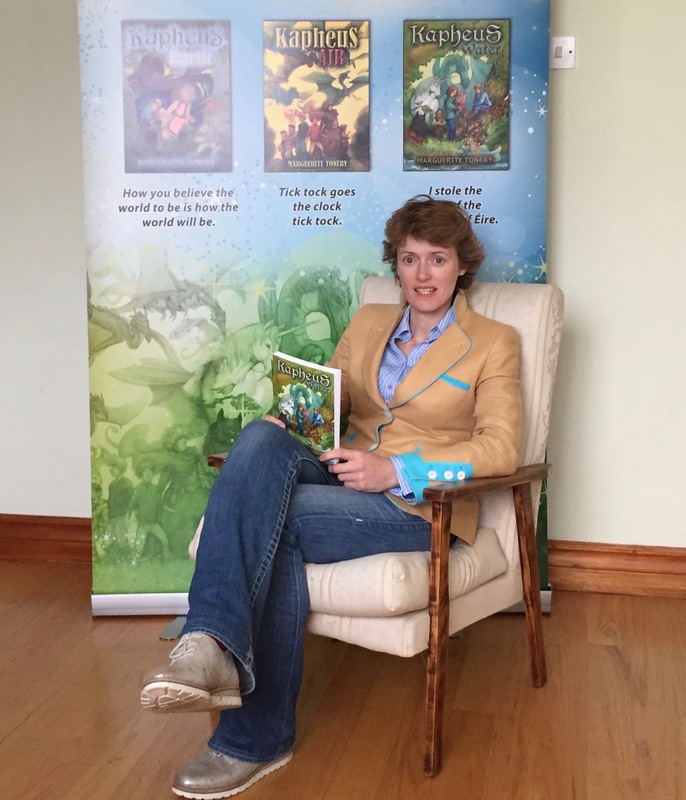 Have a look here how the adventures of Elisa and Jamie and the destiny of Éire continue. Order your copy now! 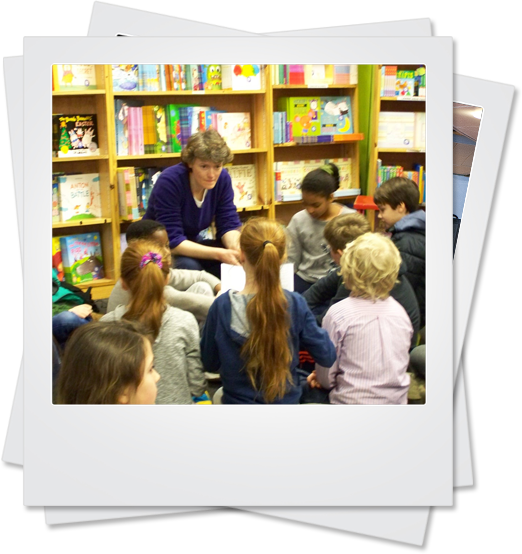 With ‘Sponsor a Book’ you can ensure that your designated school and/or public library will receive books from the Kapheus series and make them available to even more children. Adding these books to a library means that more children can share the book, read it and be impacted by Irish literature. Is í Marguerite Tonery an scéalaí agus an t-údar fuinniúil agus cruthaitheach a scríobh an tSraith Kapheus. Go raibh maith agaibh as teacht anseo chuig mo shuíomh gréasáin. Marguerite Tonery is ainm dom agus chruthaigh mé an Sraith Kapheus do pháistí. Tá na leabhair seo lán le laochra miotaiseolaíochta agus le hoidhreacht na hÉireann. Nuair a scríobh mé na leabhair seo, chuir mé béim mhór ar chultúr na hÉireann agus ar spiorad na hÉireannaigh. Táim bródúil as an dtír seo agus bhí sé tabhachtach dom píosa dár gcuid dteanga a chuir isteach sa leabhair. Mar sin, deireann na síofraí cúpla abairt as Gaeilge tríd na leabhair. Tá an leabhar, Kapheus Water, an-thabhachtach dom agus canann an síoga, Sinann, an suantraí Seoithín Seó tríd an leabhar. Chuir mé brí agus anam i mo chuid scríobh nuair a fuair Kapheus Earth spás ar seilfeanna leabhar i siopaí leabhar ar fud na tíre ag am Nollaig 2014. Tháinig an maisitheoir, an dearthóir, an clódóir agus na bainisteoirí siopaí le chéile chun go mbeinn in ann mo sprioc a shroich. Ba é David T. Wenzel, an maisitheoir don leabhar The Hobbit, an maisitheoir do Kapheus Earth, Kapheus Air (Nollaig 2015) agus Kapheus Water (Nollaig 2016). Fuair an tSraith Kapheus alán léarmheasanna dearfach sa nuachtáin, sna hirisí, sna blaganna agus ar na stáisiúin raidió in Éirinn. Bhí Kapheus Air ar an seilf leabhar eisiach ar an Late Late Toy Show ag am Nollaig 2016.